Jumpstart To A Healthier, Thinner You With The Detox Plan for Athletes without starving yourself or using fake shakes! This Detox Plan for Athletes plan will change your life. It is really easy to follow for athletes and non-athletes alike! You will be leaner, feel healthier and perform better! Plus you get to eat! Replace the foods that make you sluggish, slow your recovery time and make your muscles and joints ache. This Detox Plan for Athletes will help you eat clean, eat real food and find your inner athlete. Burn clean, have more energy and fit into your ‘skinny jeans’ and race kit without the muffin top! 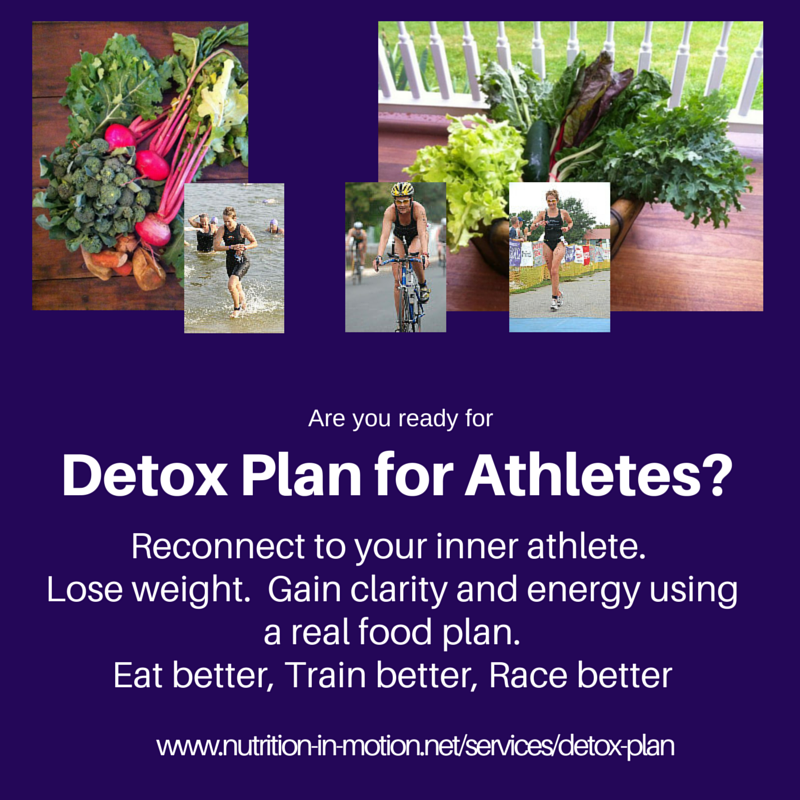 Click here to get the Detox Plan 4 Athletes Plan for $250…. and find a leaner, healthier athlete in you! Click on the link to order your just the ebook! or to add a single 30-min session. Join the Facebook group for support and new recipes. Sleep better, wake up refreshed! Perform better, swim, bike and run faster! Get rid of seasonal allergies as well as food allergies, and more. This plan can be done several times a year. Every athlete (runner, cyclist, triathlete, endurance athlete, ultra runner, ultra cyclist) should do it once a year! Click here to get the Detox plan! Want to see the Table of Contents? Click here. The 2 Week Detox Plan, or the Mini Detox Plan. Click The Detox Plan Descriptions to help you choose which is best for you. Want group support? Join the Detox Plan Facebook group! Need a Detox Cooking Class to make your plan easier? Only $35 pp for a group of 4 minumum. Do you need a detox? Take this Detox Questionnaire! My diet has significantly improved! "Just wanted to send you a quick note thanking you for the help when we worked together in the fall. My diet is significantly improved thanks to your guidance. I celebrate small victories like filling most of the shopping cart at the grocery store in the produce section! I remain hooked on smoothie concoctions for breakfast adding kale and a bunch of other good stuff. Lunch is the rainbow with raw veggies, nuts and lean proteins. As my training continues to ramp up for season i do make sure i am adding enough carbs but eating mostly whole fresh foods. Training is going well, i just PR'd half marathon at 1:29, and feel great. detox is a piece of cake! I am on Day 2 of my 2-week detox and so far it is a piece of cake. "Thank you again for all your help. ...we seem to have found the problem and with your help, I am able to get myself back on track again"
"I thought my diet was nutritionally fine until I signed up for the 2 Week Detox Plan for Athletes. By the end of the detox program, my body felt great! Joanna not only showed us how to make and eat great tasting food, but she did the group class, too. I have continued on a diet consisting of vegetables, fruit, chicken, fish and staying away from processed food as much as possible.